Russian Investigative Committee claims that it made big progress towards the identification of the masterminds of the murder of Novaya Gazeta investigative reporter Anna Politkovskaya. Detectives investigating the murder of Novaya Gazeta reporter Anna Politkovskaya are very close to the identification of persons who ordered the high-profile crime. The possible involvement of Boris Berezovsky and Akhmed Zakayev has not been proven so far, Russian Investigative Committee spokesman Vladimir Markin told Interfax in an exclusive interview. Politkovskaya was shot dead on October 7, 2006 in an apartment block in central Moscow, where she lived. "I can say that the strategy and tactics of the investigation of the Anna Politkovskaya murder are aimed at the consistent collection of evidence, which would both validate the charges and help identify the masterminds of the murder," Markin said. "Detectives have achieved their goals, and we have made big progress towards the identification of the masterminds, whose criminal cases have been separated and are being investigated actively," he said. 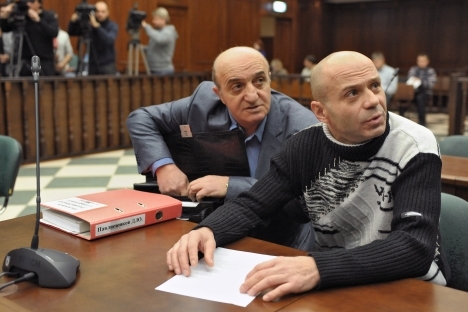 As known, ex-policeman Dmitry Pavlyuchenkov, convicted within this case, said that he learned from a suspected organizer of the murder, Lom-Ali Gaidukayev, that the murder of Politkovskaya was ordered by former emissary of Chechen separatists Akhmed Zakayev and exiled oligarch Boris Berezovsky. "This theory has not been confirmed as of the current stage of investigation," Markin stressed. Meanwhile, the relatives of Politkovskaya have no facts confirming that the investigators are close to determining the masterminds of the journalist's killing. "We do not have a single piece of information on this," Politkovskaya's son Ilya told Interfax on Monday. "We have not seen any expert decisions or documents that bring us closer to the understanding of who the mastermind is. When the first talks about Berezovsky began, we always said there is no evidence of his involvement. I'm happy that they [the Investigations Committee] have decided the same." There are currently six suspects in the Politkovskaya murder case: brothers Rustam, Ibragim, and Jabrail Makhmudov, Sergei Khadzhikurbanov, Lom-Ali Gaitukayev, and former police officer Dmitry Pavlyuchenkov. They are charged with violations of two articles of the Russian Criminal Code: Article 105 (murder) and Article 22 (illegal weapons sales). He admitted organizing surveillance of Politkovskaya, famous for her critical reports on human rights abuse in Chechnya, and entered a plea bargain testifying against five other suspects. "According to the investigators, Gaitukayev is the organizer of the crime. He created an organized group, which comprises the suspects, in 2006," Markin said.